It’s been a week since my last entry and ironically I just came home (cabin) from the second summer concert up in Idyllwild. This evening was a jazz quartet playing Cole Porter tunes, none of which coaxed dancing out of the crowd as the salsa had last weekend. It was still a wonderfully pleasant afternoon in the park, even Tucker had a great time. 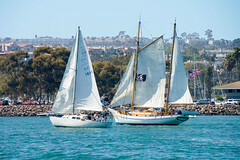 truly love sailing. Love love love sailing. Someday, perhaps when I get back from my travels I’d very seriously like to try living on a boat and I’d like my next world wide adventure to be sailing a boat to the remote corners of the globe. Until then day sails with friends with access to boats is a wonderful appetizer. Sailing on Saturday didn’t disappoint. 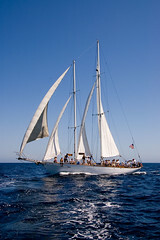 The weather was perfect, 14 knots of wind, sunny and 80ish degrees off shore. 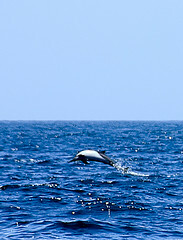 We saw a huge pod of dolphins, which I don’t think were the bottle nose dolphins variety we usually see in SoCal. At the time I thought they were Spinner dolphins, which would be very usually this far north, it’s more likely they were pacific white-sided dolphins. They were jumping quite a bit in the distance, probably feeding, but didn’t come over to play around the boat. The best shot I got was still from about 200 meters away. A little while later we spotted a whale far off in the distance, likely a blue since it’s to late in the season for California Gray’s. It spouted a couple times and we tacked in hopes of getting closer, but no luck on seeing her again. It was a magically day, I so love being on the water and having such an unusual plethora of marine life joining us made it one of my best days sailing ever. Saturday evening, I finally got a chance to see John and Kerry’s new home. They bought and moved in about two years ago and have been doing major remodeling ever since. They do a lot of the work themselves and it’s coming along beautifully. I must mentioned though that over the eight or so years I know John, he has lived in a home undergoing major remodeling about seven of those years. It’s makes me wonder if he likes having partially functioning bathrooms and exposed wall studs. Sunday, Elena and I went to see Pirates of the Caribbean. Timely since while out sailing the day before and snapped this photo of a beautiful old gaff rigged wooden schooner flying the skull and cross bones. Flying the skull and cross bones has become increasingly trendy around here, but it’s still fun to see it on a classic boat like this one. Regarding the movie I was a bit under whelmed, as was Elena. Some people seem to be loving it, maybe we weren’t in the right mood. It seemed all action and no connecting plot. Still a nice day spent with my love. Monday, I headed back to the cabin and decided another cabin improvement project was in order. Perhaps inspired by John and Kerry’s house. Anyway, needing something to do around the cabin, besides sit around inside and out on the laptop, I ripped an opening into the attic. I’ve wanted to build some cabinets or shelves into the attic space which were accessible from the landing in front of the bathroom for a while. I had written the project off as too big and time consuming to get done before I hit the road. However, since I’m still waiting for my van to come back form the air conditioning shop and it looks like another whole week, I decided I’d dive into a new project. Besides I needed to find somewhere to put all my extra stuff that’s still clogging up the living room that I can’t seem to fit in the garage or lower bedroom. Also I’m really not in the mood to finish the front railing project that I started last week, more on that when I actually work on it again… but let’s just say that removing the bark from a ceder tree trunk is not the most fun in the world. As many great things begin the project started with breakfast at Cafe Aroma, I really can’t overstate how much I love spending the morning there… Then I spent a good while at the hardware store buying lumber and came home to begin work. The above pictures tell the story better than I could with words. By 9pm I’d gotten most of the internal frame to the cabinets built and decided it was time to stop using the power saws outside for the sake of my neighbors peace and quiet. It is after all a peaceful mountain town where sound travels far in the very quiet forest. It was a bit disconcerting sleeping in the room with an open door looking out at the gaping hole into the attic. I’m not normally worried about bugs and small furry things when I sleep, even up here where they are common. However, having the giant gaping hole into the attic for them to all come marching through made for not the best nights sleep. In hindsight I really probably should have at least closed the door, but for some reason I think I wanted the cooling summer breeze. This is what the living room looks like at the moment. Notice the plastic boxes that will be going in the cabinets when they are complete. In the left photo you’ll see the railing for the landing from which the cabinets are accessed. The open door on the landing is the bathroom and to the right of the bathroom door is the bedroom door. Somewhere in the middle of the room under everything is a table. You’ll notice there isn’t much room for walking in and out, especially when carrying large boards or sheets of plywood. Wednesday, I finished the internal framing, spent more time at the hardware store figuring out how to face the cabinets and got the basic face frame built. Here’s what got done on Wednesday. It was a lot of work building the partition for the right most cabinet and getting the bottom board just the right shape to match the existing ceiling below the cabinets. You’d think it would just be straight, but the board was bowed, or the ceiling was, either way it was a lot of work to get them to match. Lots of little things changed in the design on Wednesday as well that caused some re-working. I’m happy with all the final decisions. It’s also worth mentioning I spent a LOT of time deciding if I wanted the holes on the left to be cut out of a single sheet of plywood, or to make them out of several small pieces. In the end I decided on the several small piece strategy which is why you can see a little horizontal seem in the far upper left corner which will get covered with trim and in hindsight was definitely the right choice. This is a far more common (in modern times) tongue and groove joint. Typically there is a deep v-groove between the boards, this example has a small v-groove where the picture says “Bevelled Edges”. The problem is you can’t buy ship-lapped wood planks, you can only buy tongue and groove wood planks. The TNG would not match all the existing doors and the bevelled groove running down the joint would look out of place. So I figured I’d buy TNG and cut off both sides making it narrower and then with a table saw or router cut a ship-lap joint into the end. Only I didn’t realize until I brought it home from the hardware store that 1×8 TNG with the TNG cut off wouldn’t be wide enough for what I wanted. Fortunately I realized this before cutting it. So, I took the 1×8 TNG back . The only thing less fun than loading wood you just bought on your car, is re-loading that wood on your car to return it. Anyway, I exchanged the 1×8 TNG for 1×12 (without TNG), about twice as expensive because of the width. If I had cut the TNG off the 1×8 I’d have been left with a 6″ wide board. I needed 7.5″ wide boards. In the end I varied the width and ended up making 6.5″ and 8″ wide planks out of the 1×12, I still couldn’t have used the TNG. Once cut to the right widths I cut a ship-lap edge onto the boards and built the doors. It all went smoother than I expected. With doors built, but not installed I headed down to the weekly summer concert which is where this entry began. My plan was that after the concert I’d come home and install the doors. I figured I could install the doors as late at night as I wanted since the only tool necessary was a power drill and I’d be inside. Only I came home and realized I forgot I need to install small fir strips behind where the brackets will mount and the fir strips need to be ripped (sawn) in half to be the right size… so long story short, I can’t install the doors tonight, BUT that also meant I could finally get up to date on my blog. …and with that done I’m going to bed to hopefully get a night of sawdust free sleep without fear of creepy crawlies marching into my bedroom… All so that I can get up bright and early to finish this project. Well finish everything except for the painting/staining which will likely not happen until next week. Ok my love… no excuses now. You have left home and are having adventures, and we want to hear about them! And please gives us all a glimpse of the great cabinets you created for the cabin!